Brazil has come out with a new strategic plan to guide its space efforts through 2021 that involves a significant change in its effort to develop a domestic satellite launch industry. 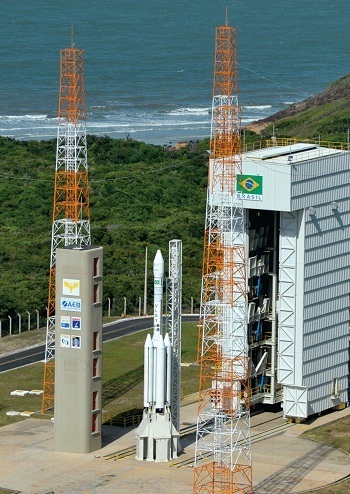 Brazil has scaled back an ambitious Southern Cross development program to focus on a series of smaller launch vehicles that appear to rely more on home-grown technology. The country also has forged a cooperative arrangement with Germany to develop a dedicated micro-satellite launch vehicle. Meanwhile, Brazil is continuing work on launching Ukraine’s Cyclone-4 rocket from the Alcantara Launch Center in 2014. Below is an image showing Brazil’s planned launch vehicles, followed by a table with details on each one. This is a significant change from Brazil’s previous plan, which featured close co-operation with Russia to develop a new family of boosters under the Southern Cross program (see image below). 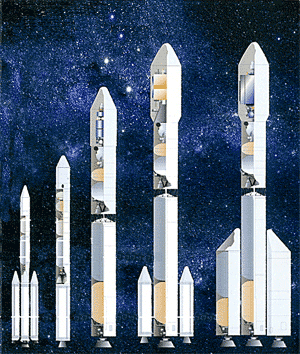 The series would have incorporated technologies from Russia’s Angara family of rockets. Epsilon (heavy) – 4 tons to GTO. The Alfa and the Beta rockets appear to have been preserved under the new plan while the Gamma, Delta and Epsilon launch vehicles are no longer there. The Delta launch vehicle’s payload of 1.7 tons to GTO would have been similar to that of the Cylcone-4, which will be able to loft 1.6-ton communication satellites. The other notable change in the plan is that Brazil and Germany are jointly working on a micro-satellite launcher that would be capable of lifting payloads weighing 150 kg into a 300-kilometer orbit. It will be interesting to see how well the launch vehicle competes with other small satellite launchers now being developed in other countries. I haven’t been able to find an explanation for why rocket development has been scaled back. However, the document states that this plan is designed to be more realistic than previous ones, so this is likely a nod to budgetary realities and the current limits of Brazilian rocket expertise. I’ve also heard that the Russians have never been that pleased with Ukraine’s role in developing Brazil’s space industry. However, Russia remains involved in the development of the VSL-1 launcher. It’s not clear what role the Russians might have in developing Brazil’s other boosters. Overall, Brazil’s space plan calls for the expenditure of 9.1 billion reals ($4.6 billion) on the space program through 2021. A total of 47 percent of the budget is devoted to a series of satellite missions, with an additional 26 percent for space infrastructure and 17 percent for space access projects. The launcher development program is estimated to cost 1.58 billion reals ($802.5 million). The Cyclone-4 program, which is a separate budget item, is budgeted at an additional 459.8 million reals ($233.8 million) during the 10-year period. Together, that amounts to just over $1 billion. The plan also allocates 1.9 billion reals ($970 million) for space infrastructure improvements, much of it listed under the categories of space access and the Alcantara Launch Center. Alcantara is close to the equator, which makes it ideal for launching communications satellites and a potential future rival for Europe’s launch site in French Guiana. However, with the Cyclone-4 limited to 1.6 metric tons to GTO, Brazil won’t be able to launch the larger communications satellites. Ukrainian and Brazilian officials have discussed the possibility of jointly developing the Cyclone-5 rocket, which would be an upgraded version of the launch vehicle set to make its debut next year. Details of the proposal are non-existent, but it is possible the rocket could fill the role of the Epsilon launch vehicle for heavier payloads. Brazilian officials might be reluctant to make any decisions until they know how well Cyclone-4 performs. It has been a rocky partnership between the two countries, with the project suffering years of delay and funding difficulties. There’s also no funding in the 10-year spending plan for developing a follow-up launch vehicle. Another option for Brazil would be to bring in another rocket for heavier payloads. Last month, SpaceX Director of Business Development Stella Guillen paid a visit to Brazil to get a better understanding of what the country is doing in space and to discuss potential partnerships. Alcantara would offer SpaceX’s Falcon 9 rocket an equatorial launch site, which is something the company lacks in the United States. I have no idea whether either party is interested in the idea, but it’s an intriguing possibility. It could be done relatively quickly with no need to develop a new booster. The biggest expense would be the infrastructure. One factor that would tend to argument against such a deal is Brazil’s desire to master rocket technology. Why bring in yet another foreign rocket into Alcantara? Why not take the knowledge gained during the next seven years to construct a home-grown vehicle? The Southern Cross program was unrealistic, and we have a long way to go to make the VLS-1 operational. The first mission of the VLM rocket will be the German Shefex III experiment. There are other missions proposed by the Brazilian Scientific community, but nothing official. 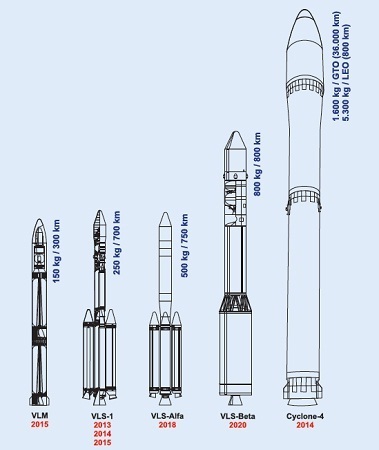 About the Cyclone-5 rocket, there is a plan to use four boosters, derived from the S43 engine, the booster of the VLS-1. This configuration would increase the capacity to 2.400kg to GTO. But this plan depends on the success of the Cyclone-4. I’m Brazilian and I’m impressed with the accuracy of the informations in this article. Truly We (Brazilians) have already the technology for launch the VLS-1 since 2011 and We just need to do some specific tests to make It finally fly, but that wasn’t possible because of the low budget given by the government to our space program. The government invested not more than 190 millions reals in our civil space program this year (including satellites and all other stuff). The Cyclone-4 is a disaster in all levels, and there is even a petition against It. It’s not certain If there will really be a Cyclone-5, and the resources given to the Alcantara Cyclone Space could accelerate our own genuine Brazilian space program. Our hopes are in the VLM, to be launch in 2015, as said by Heverton. The VLS-1 will just do a few satellite launches (If not just one), because is just a kind of transition to Our VLS-Alfa. You mention one thing I should have stressed more in the article: that these really depend on the government stepping up with more funding than it has been willing to do so far. I know that Cyclone-4 is quite controversial, not only for the delays and financial problems but because the rocket uses toxic fuels that the rest of the world is moving away from. I think the Russians banned the Cyclone rockets from their facilities for this reason. I wonder if SpaceX could even get a falcon rocket to Brazil, given the ITAR restrictions? Good question. XCOR plans to fly out of Curacao under a wet-lease arrangement (only XCOR personnel involved in operating, maintaining the vehicle). I’m guessing something similar could be worked out for SpaceX, but that’s simply speculation because I don’t even know whether SpaceX is even considering such an idea.